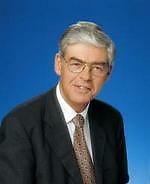 Info Alan Dukes (born 20 April 1945) is a former Fine Gael leader and TD. He holds the distinction of being one of only five TDs to be appointed Minister on their first day in the D�il. Alan Dukes was in Dublin and educated locally and at University College Dublin. In 1969 he became an economist with the Irish Farmers Association (IFA) in Dublin. He later moved to Brussels to work at the European Commission. In 1979 he stood as a Fine Gael candidate in the European elections in the Munster constituency. He was unsuccessful in his bid, but he stood again for Fine Gael in the 1981 general election. He won a seat and was elected to D�il �ireann. On his first day in the D�il he was appointed Minister for Agriculture by the new Taoiseach - Garret FitzGerald. That particular government collapsed in February 1982 but returned to power in December of that year. Dukes was promoted to Minister for Finance. He held that position until 1986 when he became Minister for Justice in a major Cabinet reshuffle. Dukes was elected leader of Fine Gael in 1987 following the resignation of Garret FitzGerald due to poor results in the general election. Under his leadership the part regained some seats in the 1989 general election. However, the party was further humiliated in the 1990 presidential elction when its candidate, Austin Currie, came an embarrassing third out of three candidates. Dukes was blamed and was forced to resign as Fine Gael leader. In September 1992 the new leader, John Bruton, brought him back to the front bench. In February 1994 he became involved in a failed attempt to oust Bruton as leader and subsequently Dukes resigned from the front bench. In December 1994 Bruton became Taoiseach and Dukes failed to secure a ministerial position. Two years later in December 1996 Dukes returned as Minister for Transport, Energy and Communications following the resignation of Michael Lowry. In 1997 Fine Gael lost power and Dukes became Chairman of the Irish Council of the European Movement. In 2001 he backed Michael Noonan in his bid to become leader of Fine Gael. Noonan was successful. An outstanding politician and legislator, Dukes represented his constituents and the Irish electorate with great vigour, passion and excellence. Has since retired from politics after losing his seat in the general election of 2002 after Fine Gael's worst electoral defeat in its history. Alan Dukes is now committed to Europe where his passion always lay and was recently appointed as Director General of the Institute of European Affairs.